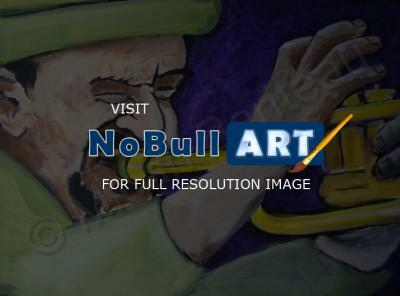 THIS HORN PLAYER WAS DONE IN ACRYLIC. PURPLE , YELLO, GREEN.16"X20" ALL DONE WITH REAL PAINT AND BRUSHES. NO CGI. NO COMPUTER ENHANCEMENT OR EFFECTS. MICAH HAS BEEN COMISSIONED TO PAINT PORTRAITS, ALBUM COVER ART,CONCEPT INSTALATIONS,LIVE PAINTING TO MUSIC,PAINTING BANDS LIVE AND MURALS IN BOTH PUBLIC AND PRIVATE PLACES THROUGHOUT THE UNITED STATES, MEXICO, CANADA, THAILAD AND BEYOND.CALIFORNIA IMPRESSIONIST MICAH BARITEAU PAINTS MUSIC SCENES . PAINTING LIVE AT CONCERTS, FESTIVALS , COFFEE SHOPS AND EVEN IN HIS STUDIO MICAH CAPTURES THE MOOD OF THE MUSIC AS ITS HAPPNING. HIS STYLISTIC APROACH LENDS TOWARD THE IMPRESSIONISTS. HE ATTEMPS TO LET THE MUSIC DIRECT THE PAINTINGS.